The Grady collection offers contemporary style that is comfortable and perfect for everyday use in your living room or family room. 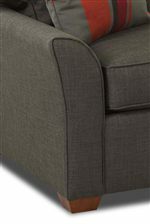 These high quality and well-built upholstered pieces will stand up to use by your whole family. Clean lines, welt cord trim, and tapered arms create a modern look that is approachable. Create a fun and inviting space for the family to gather in your home, with the Grady collection. Browse other items in the Grady collection from AHFA in the area.